I have enjoyed South-East Asian food since I spent a summer travelling through the region several years ago. A whole new world of flavour opened up to me as I traveled through vibrant fast paced cities and quiet fishing villages. Foods and flavours which were alien and new quickly became old favourites. I had many good meals through Vietnam, Laos and Thailand, from up market restaurants to relaxed cafes and fast paced street vendors who could whip up a Pad Thai in seconds in front of my eyes. I discovered many new dishes like Pad Thai, Spicy Papaya Salad and Tom Yum Soup. I have made these dishes at home again and again. One of the stand out things about the food was how different it was to the Thai food I had tasted before back home. Each dish married the perfect combination of hot chilli tempered by sweet sugar and sour Lime. Sometimes on a cold winter evening I think back to warmer times on beaches and in tropical villages and on those days Thai Curry Sauce out of a jar is a poor substitute for the real thing. So here is my recipe for a Thai Green Curry. It’s not a quick meal to make but if you take your time it will be well worth the effort. I made it with Tofu but you could use Chicken, Prawns or chunky white Fish. You could also make it vegetarian by adding more vegetables and Chickpeas for protein. 200g Marinaded Tofu (you could also use Chicken, Prawn, Fish or extra Vegetables). 1tbsp of Either Soy or Fish sauce. 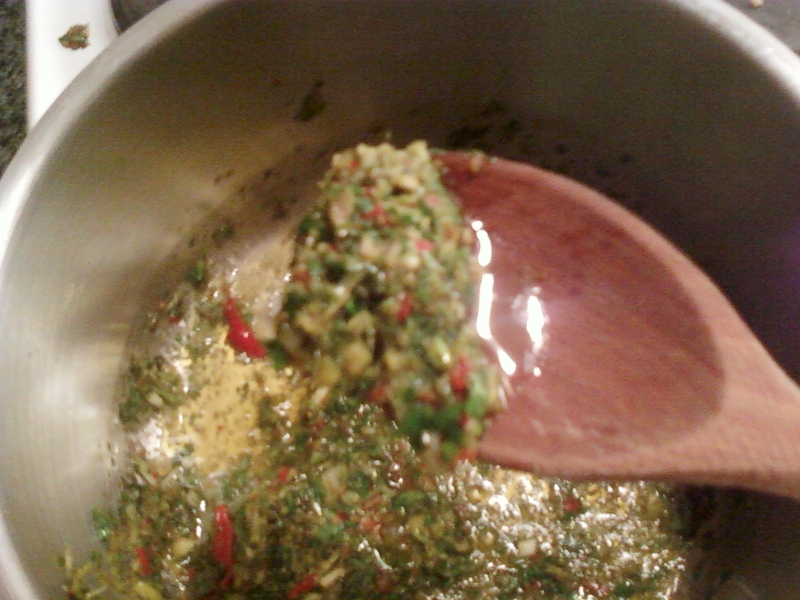 Begin by making the Green Curry Paste. Roughly chop the Shallotts and Chilies and add to a food processer. Remove the outer leaves of the Lemon Grass and roughly chop then add to the to the food processer. Grate in the ginger and add the Coriander Seeds, Lime Leaves, Fresh Coriander and Basil Leaves and the Brown Sugar. You will need to add Sesame Oil to blitz it into a paste. Set the food processer to pulse and slowly blend to form a paste. Add more Oil if necessary. Set to one side. Prepare the Vegetables. Evenly dice the Green Pepper, Carrot and Courgette. Chop the Broccoli, Green Beans and Baby Corn. Wash the vegetables. Lets get cooking. You should now have a paste to form the baso of your curry. Heat 1tbsp of Sunflower Oil and 1tbsp Sesame Oil in a pan. Once hot stir in the paste and cook for 2-3 minutes. If you are using Chicken or other meat you should add it now and allow it to brown for 5 minutes. Add the Vegetables and stir to coat in the sauce. Cook for 5 minutes or so to soften the veggies. Get your Coconut milk and pour it in then half fill the can with water and pour in as well. This should give it a glossy creamy texture. Stir the vegetables through. 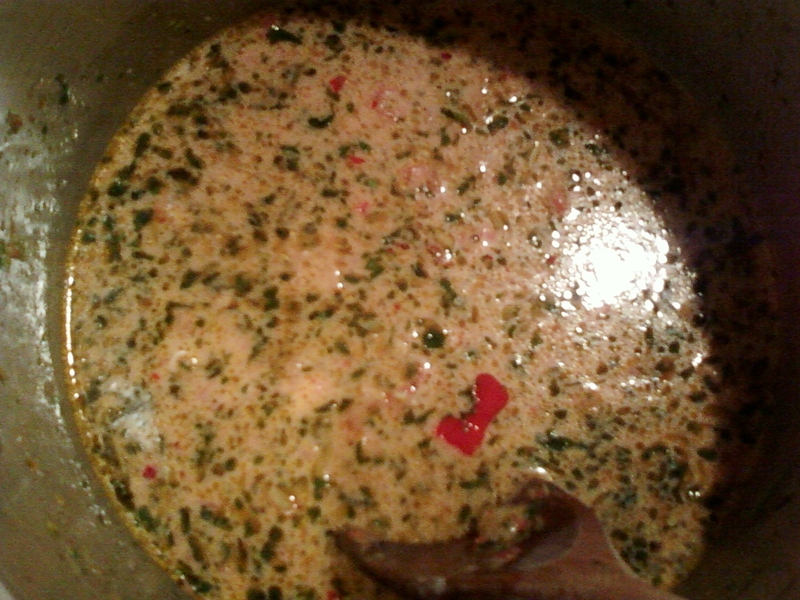 Bring to the boil then reduce the heat and simmer uncovered to reduce the liquid and thicken the sauce. This should take from 5 – 10 minutes. If your using Tofu (or cooked prawns) add them in now as they will need very little cooking time. Taste the sauce and season with Soy Sauce if necessary. Serve over Fragrant, Thai Rice with a Lime wedge and some of the Coriander. ← Flickr update – Photos from France.